There are sensation media reports of "mass animal deaths across the globe" in the past two weeks, which some have dubbed the Aflockolypse. Is it a sign of the end times, they ask? But, sadly, it is a sign of the end times of decent journalism. There are basically two categories of "mass animal death"; birds and fish. The fish (including some devil crabs, which I realize are technically not fish) seem to have mainly died from .... cold. In case you haven't noticed, the northern hemisphere has been a tad cold this Christmas and New Year. Humans weren't the only ones to suffer. Some sea and river species are very susceptible to extreme temperature changes like those that have been experienced lately. 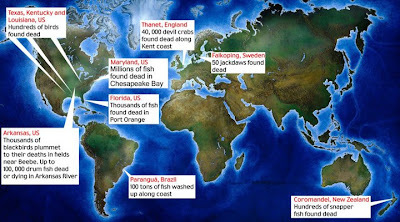 So the UK's Devil Crabs (oooh, devil, does that mean the Aflockolypse is biblical? ), Chesapeake Bay's fish, and even Brazil's fish deaths are all down to cold weather (and currents). How ... boring. It happens all the time, but normally it goes unreported by the global media. But it wasn't just fish in the Aflockolypse ... there were birds! lots of birds just dropping from the skies, dead. The sky is falling! The media suggested the large numbers of birds dropping dead from the sky on New Year's Day could be a sign that the year was cursed, or that the world was going to end. 2012 was mentioned (because many journalists don't seem to know what year it is), and all sorts of conspiracy theories were 'reported'. So what killed the birds? Again, this is a common event, usually unreported by the media. Every New Year's (and on other festive occasions) there are firework celebrations at night that startle birds, who fly about blindly in the dark. The crash into things (and each other) and die of blunt force trauma, as autopsies have showed. Only the "hundreds of snapper" found dead on the shores of New Zealand seem to have a sinister side to their demise. They appear to have been dumped illegally by a fishing vessel. So much for the Aflockolypse. But reason and logic are too dull and boring to sell newspapers and gain advertising revenue. So expect more conspiracy theories. Journalists. Damn journalists, and statistics!